2. Click on Budgets in the Start tab. 3. Depending on what type of budget you want to create, choose one of the four budgets in the Edit tab: New Planned Expense, New Planned Revenue, New Actual Expense or New Actual Expense. 4. The new budget document will immediately appear in the budget list under Expense or Revenue respectively. 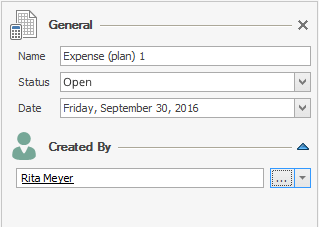 Name: Give your budgets clear names that allow you and your customers to easily assign them to a project. InLoox automatically assigns the names Expense (Actual), Expense (Plan), Revenue (Actual) or Revenue (Plan) combined with the consecutive number, depending on the budget type you have chosen. 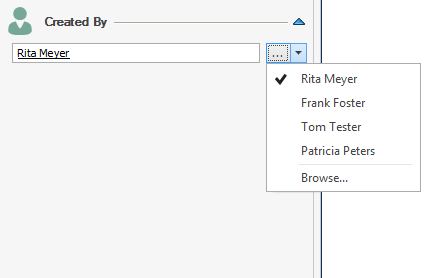 Budget Status: Choose in the dropdown list between Approved, Rejected or Open. Use the status Open for not yet received quotations or outstanding invoices etc. Date: Specify a date for the budget. InLoox assigns the current date by default. Click on […] to choose a resource from your global address book. Alternatively, click on the arrow to choose from a list of recently used resources. Create a new budget - InLoox • Copyright 1999-2019 © InLoox, Inc. All rights reserved.